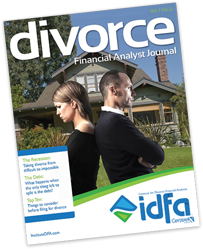 Download Your FREE Copy of the Divorce Financial Analyst Journal! Get my copy of the DFA Journal now! Download a free issue of the Journal today and explore expert insights from the divorce niche! The Divorce Financial Analyst Journal is a go-to resource to keep you up to speed in the challenging divorce niche. Ready for an annual subscription? Are you prepared to help guide your clients through the financial implications of divorce? Become a CDFA® professional today! Copyright 2017 Institute for Divorce Financial Analysts. All rights reserved.